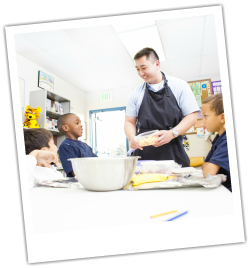 Synopsis: In the fall of 2011 Dr.Andrew Nuibe visited the Homework Club after school program at the Tahoe Colonial Collaborative and lead the 20 students in 4 different cooking lessons. Each lesson was complete with fun information about the origin and nutritional value of each ingredient in addition to hands on cooking and most importantly tasting! Each activity was very fun for all those who participated and students left with more knowledge on both nutritional eating in addition to kitchen safety. Although students were sad when the cooking lessons came to an end, they were each given a cook book complete with all the recipes Dr.Andrew showed them so they could try them at home!